Visit the Casa Mila or La Pedrera in Barcelona! The city of Barcelona is famous and loved for a wide variety of reasons: The beach, the food, the nightlife and its very special charm - and the unique architecture of the city contributes a lot to that charm. Barcelona is the main scenario of the architectural style known as Catalan Modernisme, a style that saw its golden age in the beginning of the 20th century and whose maximum exponent was famous architect Antoni Gaudí. One of Gaudí's masterpieces is La Pedrera, which is one of the most visited landmarks of Barcelona, together with the Park Güell and the Sagrada Familia - also by Gaudí! 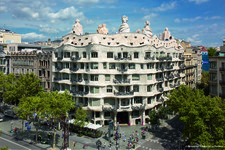 La Pedrera is located in Passeig de Gràcia, the most elegant (and expensive!) avenue of Barcelona, which makes it the perfect location for stablishing your headquarters during your visit to this beautiful Mediterranean city. Keep reading to learn all about this incredible monument: its history, many interesting facts as well as practical information, including where to get La Pedrera online tickets! La Pedrera receives around a million visitors a year, and it is the most visited civil building by Antoni Gaudí. La Pedrera is its go-to name, but this beautiful and unique building located in Passeig de Gràcia is reall called Casa Milà (Milà House), which was the surname of the bourgeois that commanded its construction. In fact, the construction of the façade of La Pedrera responded to a usual procedure in the beginning of the 20th century in Barcelona, which took place with many of other well-known buildings of the city, most of them of Modernisme architectural style. This is mostly due to the time coincidence between this and the golden age of Modernisme - but let's take a closer look, shall we? At the beginning of the 20th century, the district of L'Eixample had already formed the city of Barcelona as we know it today. L'Eixample unified the old town (the city centre and the neighbourhoods closest to the seaside) with the upper neighbourhoods of Barcelona, which were independent towns until the end of the 19th century. L'Eixample became the one of the main activity centres of Barcelona, and during that time, many rich Catalan bourgeois and entrepreneurs bought properties there and hired architects of more or less recognition to redesign their new buildings. That was exactly what happened with la Pedrera: Pere Milà i Camps, son of a famous textile businessman, asked Antoni Gaudí to design the façade of the building, located in the corner of Passeig de Gràcia and Carrer Provença, close to the Avinguda Diagonal. He intended to locate his private residence there and to rent the other apartments, as well as place different boutiques in the lower floor. 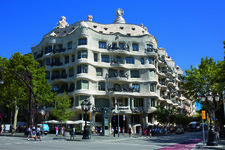 La Pedrera was built between 1906 and 1910 in the midst of several controversies. Milà had to pay several fines because the building was larger than what the city council allowed at the time, which contributed to the downfall of the relationship between the owner and Gaudí. Finally, the city council allowed several concessions and exceptions due to the artistic value of the building. Gaudí signed the document that certified the end of its construction in 1912, but the controversy didn't finish there. As it happens sometimes with wonderful art pieces, La Pedrera wasn't understood by its contemporaries as it broke with the neoclassical aesthetics of the rest of the buildings in the area, and it was object to mocking and criticism. However, as you can see when you walk around Passeig de Gràcia, Modernist buildings are not an exception anymore - and they are very well liked and appreciated! La Pedrera has had an interesting life. During the Spanish Civil war, some of it was used as the headquarters of the Economy department of the resisting Generalitat de Catalunya, and it even had a bunker underground for bombing protection. It has been the scenario of flea markets, government department offices, hostels, bingos and dating pubs, and, as you will see if you continue reading, it has some interesting functions nowadays too! By the way - did you know that there are still people living there? In 1984, the UNESCO declared the building as a World Heritage Site, together with other works by Gaudí, such as the Park Güell, the Palau Güell and the Church of Colònia Güell, one of the few works by Gaudí that are located outside the city of Barcelona. 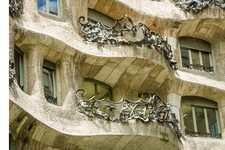 As for La Pedrera's ownership, the beautiful building changed hands on several occasions. After Milà's death, his wife sold it to a real estate agency, and it was finally acquired by Caixa de Catalunya. Nowadays, it is a property of the Fundació Catalunya-La Pedrera. And what is it that makes La Pedrera so unique? 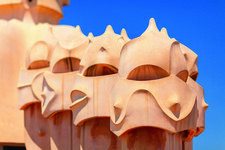 The sinuous shapes of the façade are an undeniable mark of Gaudí's style, as are the chimneys and the trencadís. As you surely know, Gaudí is the most famous architect of Modernisme, a style inspired in nature that falls somewhere between Gothic and Art Nouveau. He wanted to design a house that was on a constant curve, both inside and outside the building. And did you know that it is formed by two buildings? Light was another great inspiration source of Modernisme, and the buildings are located next to two courtyards so the natural light would illuminate the building. Inside, some of the walls are covered by paintings full of flowers and mythological references - in fact, one of the main characteristics of Modernisme is its colourfulness and attention to detail. The amazing façade is all built of limestone and the inspiration in nature is quite obvious. Paint it blue in your mind and you will feel like you are in front of the sea itself! 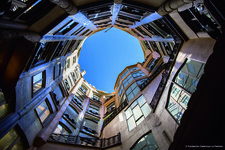 The sinuous and curvy shapes are reproduced inside of La Pedrera, too: the walls, the ceilings and the staircase all share the nature of the building. And, of course, we can't forget about which is probably the most unique part of it: it's roof terrace with the astonishing chimneys. There are twenty-eight chimneys known as espantabruixes (Catalan for "witch scarers"). The chimneys show unique and twisted shapes, which had actually a functional reason, since thanks to them, the smoke could come out better than in straight chimneys. Nowadays, La Pedrera is still a private building. This means that it doesn't belong to the city council, but to a private owner, that is, the Fundació Catalunya La Pedrera. As with other monuments by Gaudí, the entry ticket isn't cheap - but the wonders you will discover there are well worth the price. It opens every day from 9 to 20.30 for the day visits, and from 21 to 23 for the night ones. This beautiful building receives around a million visitors a year, which is why we strongly recommend to get your La Pedrera online tickets in advance. This way, you will avoid long queues and make sure that you will be able to visit it. And what kind of La Pedrera online tickets can you get? Well, there is actually a wide choice! 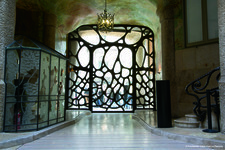 The basic day visit costs around 16-17 euros, and will allow you to visit the roof, the courtyards, the exhibits (some of the rooms are a museum), and the Espai Gaudí, which means that you will get a good and complete look at the building. The audio guide is included with your ticket. 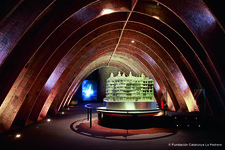 There is also a premium La Pedrera online tickets so you can avoid all queues! You can also get La Pedrera online tickets to visit the building during the night, which is a very different experience, and La Pedrera online tickets day & night, which includes two complementary visits during the day and the night. You can also choose to visit the underground garage and learn all about its role during the Spanish Civil War. This is an independent visit from the rest of the building, and it can only be done on Saturday at noon. You will need to get other La Pedrera online tickets for this one. Finally, don't forget that La Pedrera is also the scenario of concerts and other events, which you can access with a special ticket bought specially for the event you want to attend. Don't forget to check the agenda! 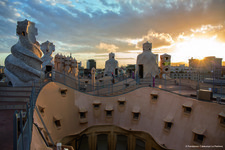 A concert at the rooftop of La Pedrera could be the perfect way to put the cherry on top of the day. 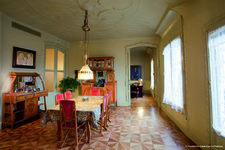 La Pedrera is in a privileged location in the heart of the district of L'Eixample, and of Barcelona itself! Once you enjoy La Pedrera online tickets, you will be able to move to any place of the city thanks to the metro stations. The one closest to La Pedrera is diagonal, where you will be able to get L3 (green) and L5 (blue), but if you walk south a little bit, you will find the station Passeig de Gràcia, where, besides the green line, you can also get L2 (purple) and L4 (yellow). We recommend you to walk until Gran Via de les Corts Catalanes if you want to get the purple of the yellow lines, since this way you'll avoid the most hated underground transfer passage of the whole city! At the south end of Passeig de Gràcia, you will find Plaça Catalunya, where you will also be able to get L1 (red). As you can see, La Pedrera is very well communicated! After you've enjoyed your La Pedrera online tickets by contemplating all the magnificent details of the building, it's time to visit the rest of the city! Passeig de Gràcia is in a privileged location for you to explore Barcelona. Other Modernist houses await you if you decide to go towards the city centre, that is, towards the sea: You will be able to see the Casa Batlló, also by Gaudí, and the other houses of the Illa de la Discòrdia (Block of Discord), such as the Casa Amatller or the Casa Lleó Morera. You can also go shopping, since you will be in the main shopping avenue of the city of Barcelona: You can find fashion for all kinds of budgets in there! 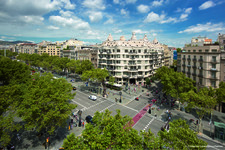 At the southern end of Passeig de Gràcia, you will find Plaça Catalunya, the door to the old town of Barcelona. There you will find the beautiful and traditional avenue of Las Ramblas, which will take you to the Olympic Port. To the right of Las Ramblas, you will find the cosmopolitan neighbourhood of El Raval, and to the left, the beautiful Gothic Quarter. If you decide to go up instead of down, you will find a good number of surprises as well. You will shortly arrive to the beautiful and charming neighbourhood of Gràcia, one of the local's favourites, full of narrow little streets, cosy cafés and bars and beautiful plazas. You will find lots of international restaurants and other great local ones where you can try the delicious cuina catalana, with way less 'tourist traps' than in the city centre. Besides, it's the perfect place to mingle with the locals and get to know a very different atmosphere than the one that can be experienced in the city centre. And that is Barcelona, too! And if you decide to go even higher and cross all Gràcia, you will be very close to the Park Güell, so you can learn even more about Antoni Gaudí's works and wonders! 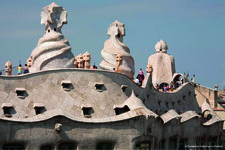 As you can see, there are lots to do after enjoying La Pedrera online tickets. Remember that you can get them with GowithOh, as well as many other services - our aim is to make your trip to Barcelona truly unforgettable!